Be the first to share your favorite memory, photo or story of Mary-Ann. This memorial page is dedicated for family, friends and future generations to celebrate the life of their loved one. Mary-Ann Ruth O'Connell, 81, of Beacon, died on Tuesday, April 9, 2019, at Ferncliff Nursing Home at Rhinebeck. Born on Sunday, January 2, 1938, in Rockville Centre, NY, she was the daughter of Alfred J. and Dorothy Lounsbury Deacon. She married Daniel O’Connell in 1956 in Lagrangeville. 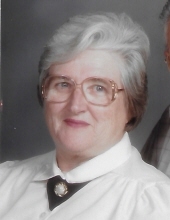 Mary-Ann was a member of the Ocala United Methodist Church. Mary-Ann retired in 2008 as an Addiction Counselor and Clinical Director for Western Judicial Services. Presently she volunteers with Hospice. Prior to working at Western Judicial she worked at DAYTOP Citra for 7 years where she held numerous positions. She was a supervisor for New Beginnings in Marion, Citrus and Hernando Counties and worked at Charter Hospital in Ocala, FL for 7 years. She moved to Florida in 1986 from New York she was active in church where she taught Sunday School for 29 years, was certified in First Aide. She was a First Aide and CPR instructor. Mary-Ann enjoyed camping and Girl Scouts where she was a Leader, Trainer, Neighborhood Chairman, and Girl Scout Fair Chairman. Mary-Ann loved camping, sewing and crafts. She was the proud mother of 4, 11 grandchildren and 12 great grandchildren. She was also a Foster parent. In addition to her husband, Daniel J. O’Connell, Beacon, surviving are daughter, Betty Skidmore, Staatsburg, son, Tom O’Connell, daughter and son-in-law, Carol and Ricky Peets, Clintondale, two brothers, Terry and Robert “Bob” Deacon, both of Florida, and many nieces and nephews. Mary-Ann was predeceased by her daughter, Patti O’Connell, her sister, Janette Herman, her brother Richard Deacon and her son-in-law, Paul Skidmore. Relatives and friends may call from 1pm to 3pm on Sunday, April 14, at Sweet’s Funeral Home, 4365 Albany Post Rd., Hyde Park. Funeral services will begin at 3pm. Cremation will take place on Monday, April 15. Donations may be made to Hudson Valley Hospice, 374 Violet Ave., Poughkeepsie, NY 12601 or www.hvhospice.org. Arrangements by Sweet’s Funeral Home, Hyde Park, NY. To send an online condolence or for directions, please visit www.sweetsfuneralhome.com. To plant a tree in memory of Mary-Ann Ruth O'Connell, please visit our Tribute Store. "Email Address" would like to share the life celebration of Mary-Ann Ruth O'Connell. Click on the "link" to go to share a favorite memory or leave a condolence message for the family.